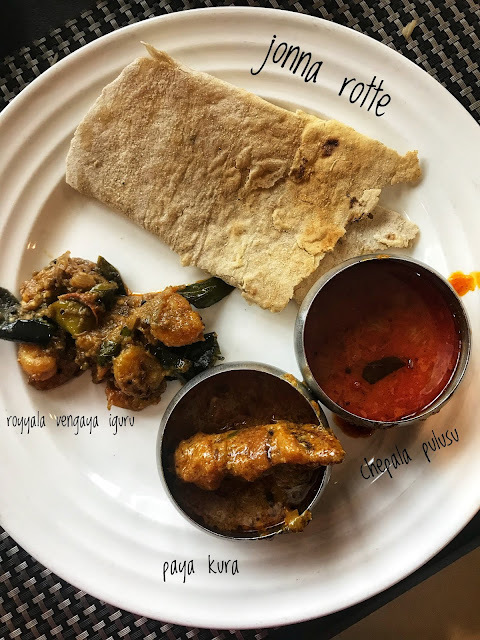 When we were looking out for places that serve authentic/traditional Andhra cuisine for lunch, few places like Kritunga, Shri Kanya & Rayalaseema Ruchulu were strongly recommended. 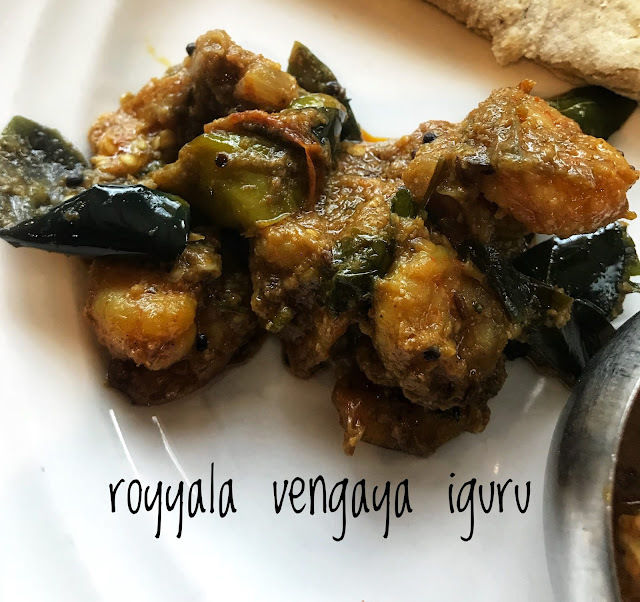 We zeroed in Rayalaseema Ruchulu for first day lunch. They have about 6 outlets across the city. 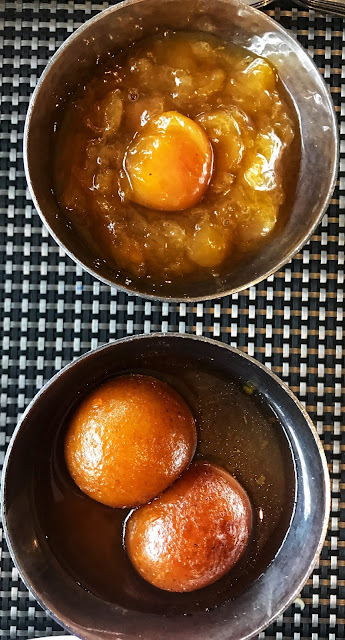 We chose the Jubilee hills outlet as few other places in our list were in and around Jubilee hills. A bright and spacious restaurant with an interesting menu. Only the Jubilee hills outlet serves buffet featuring a good lot of signature dishes from their a la carte menu. And the dishes changes everyday it seems. I don't remember the last time, when I was so confused to make a choice. I really wanted to try their Ulavucharu mamsam pulao and unfortunately that wasn't part of the buffet. While narrowing down from a la carte, the minimum dishes we zeroed in seemed to be too much for us. I made Shab go through my tantrums & the unstable mind oscillating between the buffet & a la carte. 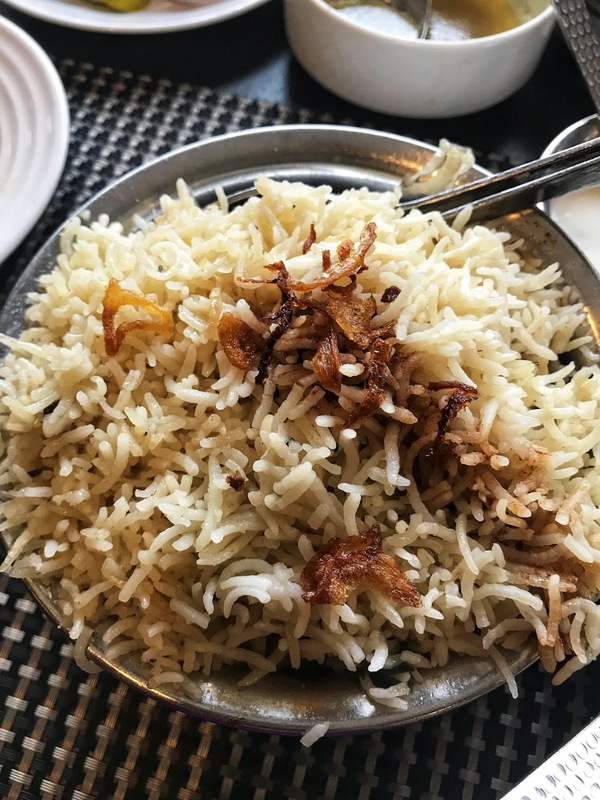 Finally we decided to go with the a la carte as it had lot of dishes we wanted to try and we ordered a portion of ulavucharu mamsam pulao separately. The mantra of the entire trip was to get a taste/glimpse of the food scene at Hyderabad and not to over eat :P Cos we had couple more places to check out after lunch. So took a little portion in everything that interested me. Started with Kodi shorba for the soup. 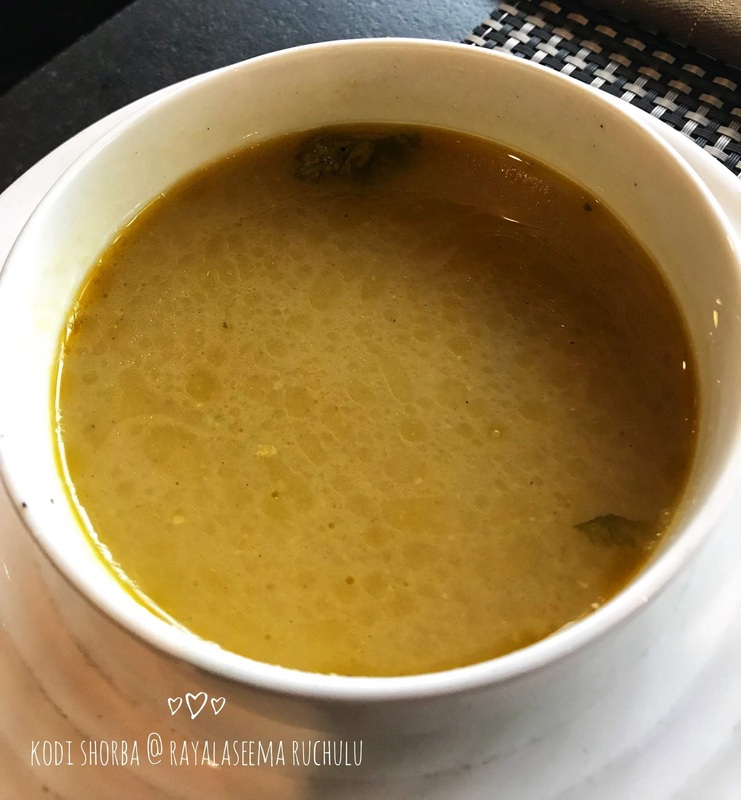 A thin flavourful chicken soup prepared in a rustic way. Perfect start to the meal. I kept myself away from the vegetarian starters and had only the non veg starters. 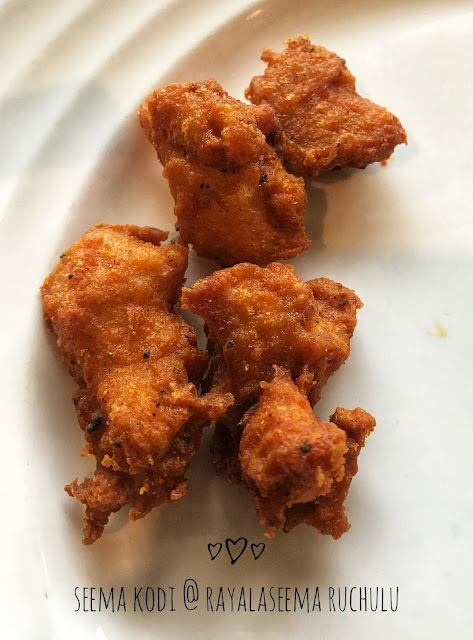 The seema kodi - batter fried chicken was good. I was in love with the ulavucharu kodi vepudu. 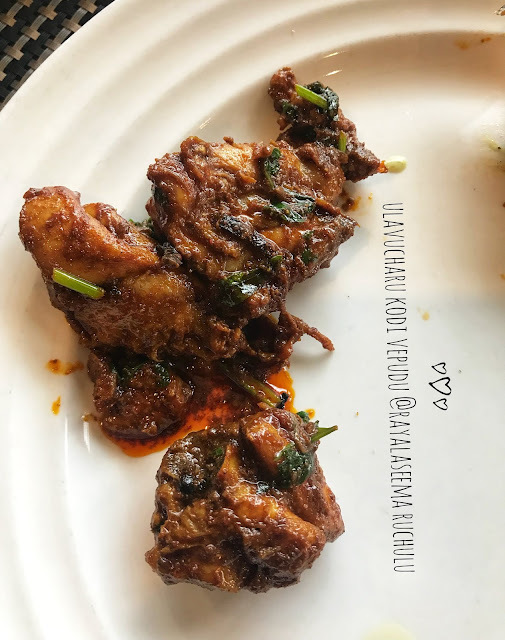 Medium sized chunks of chicken (with bone) stir fried with horesegram base was simply yummy. 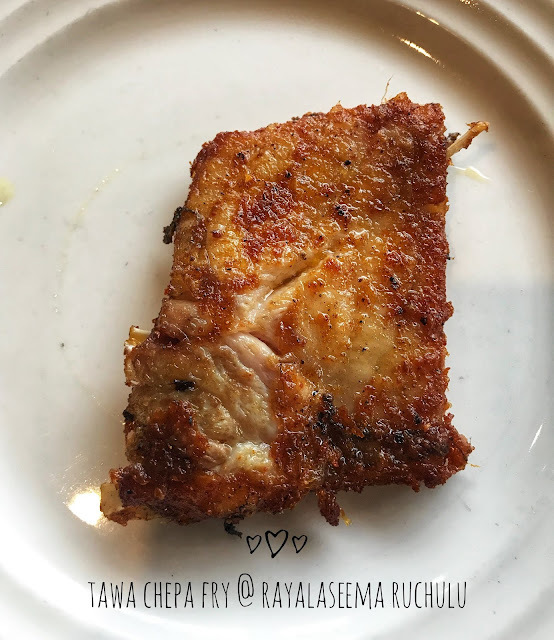 The tawa chepa fry (katla fish fry) was well made. Fresh fish, well seasoned and fried to perfection rendering a crispy, caramelised skin and soft and fall apart flesh. It was delicious. 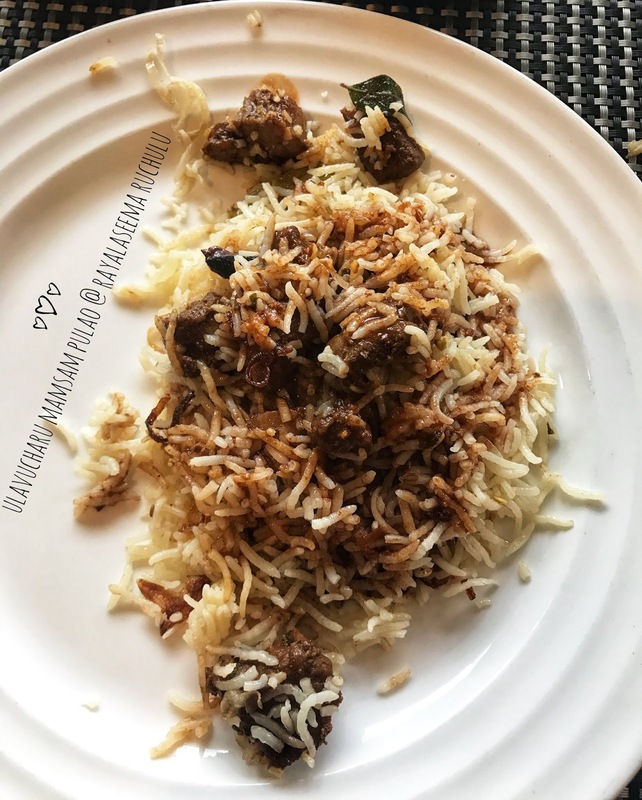 For main course we started with Ulavucharu mamsam pulao. That's mutton pulao served with the ulavucharu (horsegram/kollu) gravy. We were told that the mutton was also cooked in the same ulavucharu gravy. 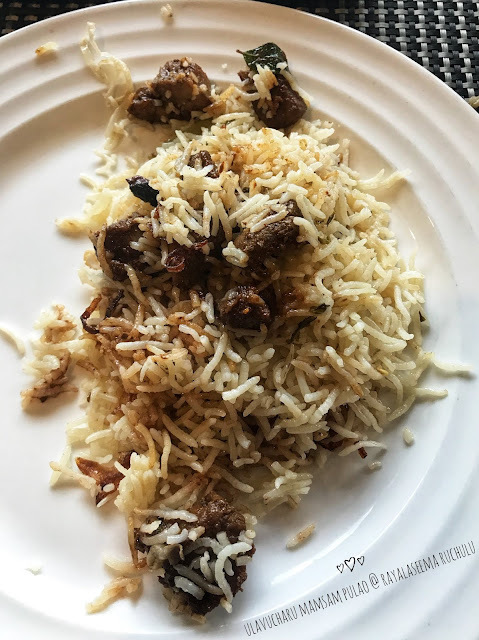 Soft & succulent pieces of mutton complimented the fragrant pulao. Mixing the gravy with the pulao, the taste got elevated to multiple levels. 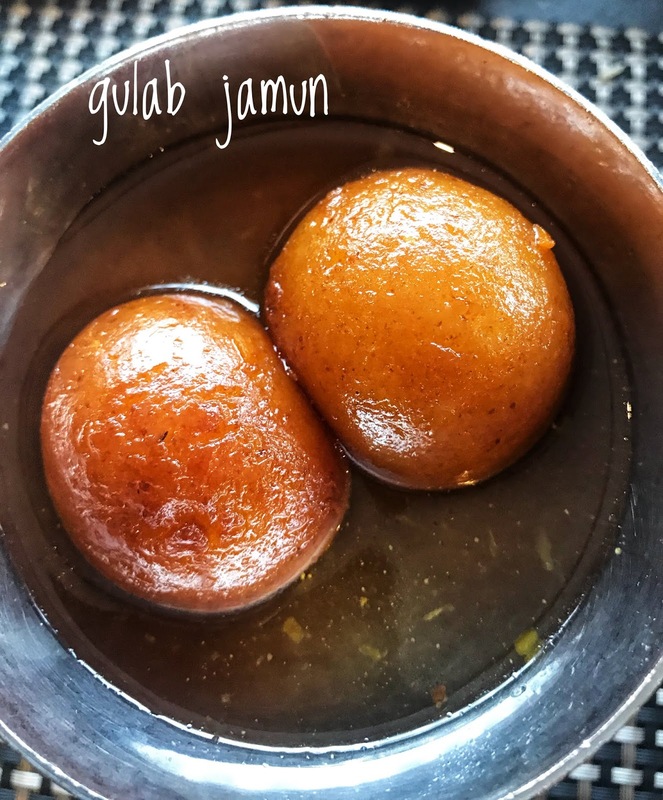 A must try dish in this place. 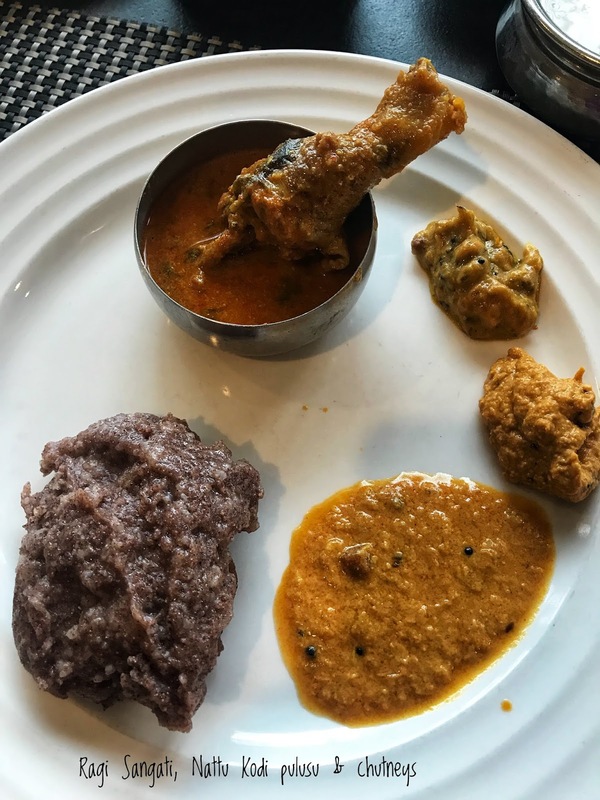 The other dish which I wanted to try was the Ragi Sangati & Nattu Kodi Pulusu. Luckily, the buffet featured these dishes. Ragi Sangati is Andhra's version of our kali. It would've been better if they were made smaller in size, which would have ensured even cooking. The portion of sangati I had some semi cooked or raw ragi rice flour. 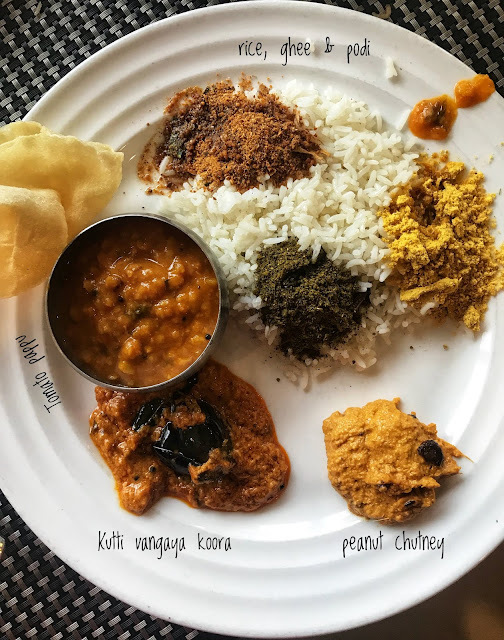 While the nattu kodi pulusu aka the nattu kozhi gravy was good, I absolutely loved the palli chutney (peanut chutney) which went well with the sankati. Next I went for some Jonna rotte (Jowar/Sorghum roti) with paya kura (paya kuruma), chepa pulusu (fish gravy) & royyala vangaya iguru (prawns & brinjal semi gravy). Roti was soft and a tad bit of ghee smeared over the roti was too good. The plump prawns cooked with brinjal was different in a good way. Tangy fish curry & paya went well with the roti. Staff were polite & patient and friendly. Service was flawless. Paid 2000 bucks in total for 2 buffet (Rs.699 plus taxes each), mamsam pulao (Rs.399) & 2 lime sodas (Rs.138). Given the taste and quantity, it was absolutely worth the money. 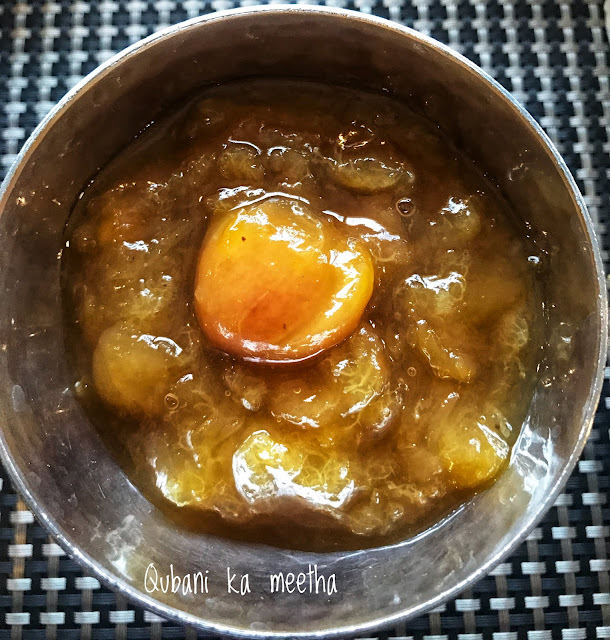 Jouzi Halwa - The Royal dessert of Nizams !! !